Red Hat Ansible Automation is widely known to automate and configure Linux and Windows hosts, as well as network automation for routers, switches, firewalls and load balancers. Plus, there are a variety of modules that deal with the cloud and the API around it such as Microsoft Azure, Amazon Web Services (AWS) and Google Compute Engine. And there are other modules that interact with Software as a Service (SaaS) tools like Slack or ServiceNow. Although the downtime for these APIs is very minimal, it does happen, and it is even more likely that the connection between your Ansible control host (where you are running Ansible from) and the cloud-centric API could be down. In this blog post, I will cover some tips and tricks for dealing with unreliable connections to cloud-centric APIs and how I build Ansible Playbooks in a reliable manner. As a technical marketing engineer, I consider my customers the Red Hat field teams, and often Solutions Architects are running playbooks from unreliable hotel wireless, coffee shops and sometimes even airplanes! I have to make sure playbooks have some more robustness built in for these odd situations. It is hair-pulling frustrating to get through a 20 task playbook for it to fail on the 19th task because your wireless went out for a couple seconds. This is especially frustrating if you are at the airport just trying to setup a demo or playground to show something to a client. Many people that use Ansible are very familiar with the loop construct. A loop (previously known as with_items) is very simple and powerful and allows you to iterate over a list or dictionary in an easy fashion. However, I find that many people are not aware of the until loop. Let us look at how this can work. The module ec2_vpc_net allows us to create an AWS Virtual Private Cloud. The name, cidr_block and region are module parameters for the ec2_vpc_net module. However the register, until and retries are task level parameters, meaning that you can use these on any module. This task will attempt to create the VPC five times before it gives up and fails. When we run this playbook with ansible-playbook test_output.yml we get some standard output (via the debug module) printed to the terminal window (or browser window when using Ansible Tower). We are registering the result of the task so we can look at the failed key, value pair. The until value is the conditional we are applying. In this case we keep running the task until the create_vpc does not have failed: true. However we don’t want the task to run this for infinity. The default value for “retries” is 3, however I have increased this to 5. The until loop provides significant robustness to the task. There is also a delay parameter that can be combined with the until loop. The delay is how much time to wait between retries. The default value for the delay is 5 seconds. Check out the documentation for more details and examples of the until loop and the delay parameter. By default, if Ansible fails the playbook will end on that task, for the respective host it was running on. If I had a playbook running on 10 hosts, and it failed on 1 host on task three out of ten, the 7 subsequent tasks would not run for that host. The other hosts would remain unaffected. With unreliable connections to an outside API we need to think about what is required and not required to define success for a playbook to finish. For example if you had a task spin up a DNS record on AWS’s Route53 service, the DNS can be nice to have, but isn’t required for you to begin using the instance you created. I can use an until loop to make the route53 tasks more reliable, but it might be OK if the Route53 service is down and unusable. I can use the IP address to get some work done done on my instance until I get a more reliable internet connection to re-run the playbook or the Route53 service becomes available again. There are some tasks that are “nice to have” vs. required. The way to ignore a failed value is to use the ignore_errors parameter which is a task level parameter outlined in the documentation here. I think there is plenty of content in the docs and various blogs about using the ignore_errors so I think it is sufficient to summarize that ignore_errors will show red and report a failed: true key, value pair, but the playbook will continue on. What happens if we want to combine the until loop with an ignore_errors? We actually get the best of both worlds with an unreliable task. We get robustness with the until loop, combined with an ignore_errors which allows the playbook to complete regardless of that task completing successfully. I find myself using this combination of ignore_errors and until loops in conjunction with services like Let’s Encrypt where it’s not 100% required for me to have an SSL cert to start using the web app (I can rely on a self-signed cert until I can figure out the problem). FAILED - RETRYING: purposely fail (5 retries left). FAILED - RETRYING: purposely fail (4 retries left). FAILED - RETRYING: purposely fail (3 retries left). FAILED - RETRYING: purposely fail (2 retries left). FAILED - RETRYING: purposely fail (1 retries left). In the Ansible workshops I am actually using this combination of error handling for Let’s Encrypt to make it easy for Ansible users to troubleshoot the issue. If there are any tasks that have a failure that can be skipped, I can add it to a variable and print it at the end of the workshop playbook (the playbook responsible for provisioning instances for students to use). In conclusion, Ansible is extremely flexible at adding some additional logic when it is necessary. The until loop can add robustness and the ignore_errors allows us to determine success criteria. 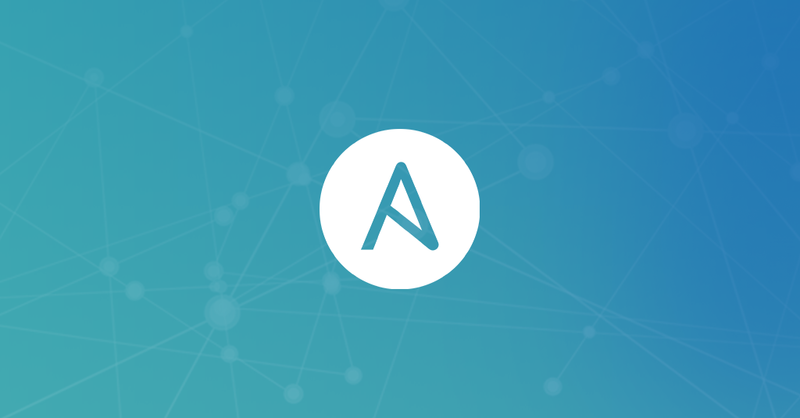 In combination your Ansible Playbooks can be much more user proof, allowing you to have a proactive vs. a reactive approach to troubleshooting issues. Ansible can’t control if an API or service is down, but we can definitely operate more robustly than home made scripts or DIY API implementations. The playbooks provided are extremely human readable and easy for novice users to understand. Apache Impala supports fine-grained authorization via Apache Sentry on all of the tables it manages including Apache Kudu tables. Given Impala is a very common way to access the data stored in Kudu, this capability allows users deploying Impala and Kudu to fully secure the Kudu data in multi-tenant clusters even though Kudu does not yet have native fine-grained authorization of its own. This solution works because Kudu natively supports coarse-grained (all or nothing) authorization which enables blocking all access to Kudu directly except for the impala user and an optional whitelist of other trusted users. The post Fine-Grained Authorization with Apache Kudu and Impala appeared first on Cloudera Engineering Blog. Searching code on GitHub is currently limited to keyword search. This assumes either the user knows the syntax, or can anticipate what keywords might be in comments surrounding the code they are looking for. 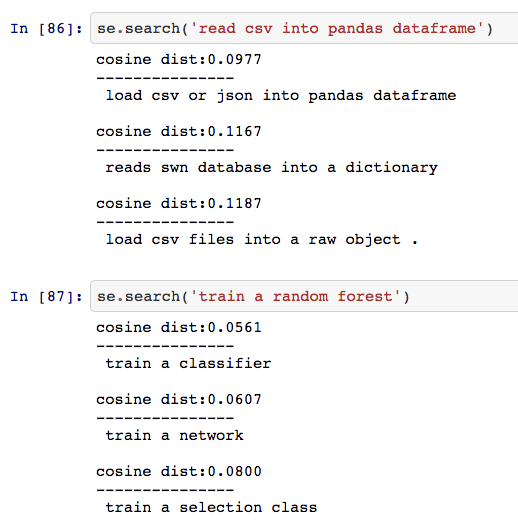 Our machine learning scientists have been researching ways to enable the semantic search of code. Note that the demonstrated semantic search returns reasonable results even though there are no keywords in common between the search query and the text (the code & comments found do not contain the words “Ping”, “REST” or “api”)! The implications of augmenting keyword search with semantic search are profound. For example, such a capability would expedite the process of on-boarding new software engineers onto projects and bolster the discoverability of code in general. In this post, we want to share how we are leveraging deep learning to make progress towards this goal. We also share an open source example with code and data that you can use to reproduce these results! It should be noted that in the above examples, the model produces the summary by using the entire code blob, not merely the function name. 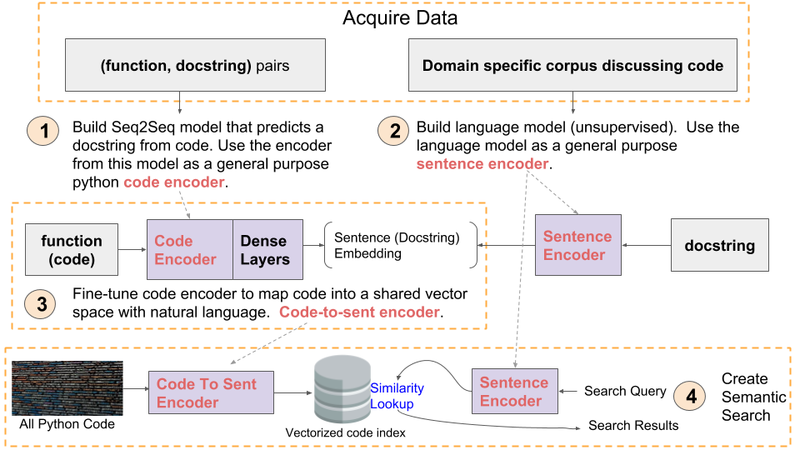 Building a code summarizer is a very exciting project on its own, however, we can utilize the encoder from this model as a general purpose feature extractor for code. After extracting the encoder from this model, we can fine-tune it for the task of mapping code to the vector space of natural language. We can evaluate this model objectively using the BLEU score. Currently we have been able to achieve a BLEU score of 13.5 on a holdout set of python code, using the fairseq-py library for sequence to sequence models. In addition to learning a representation for code, we needed to find a suitable representation for short phrases (like sentences found in Python docstrings). 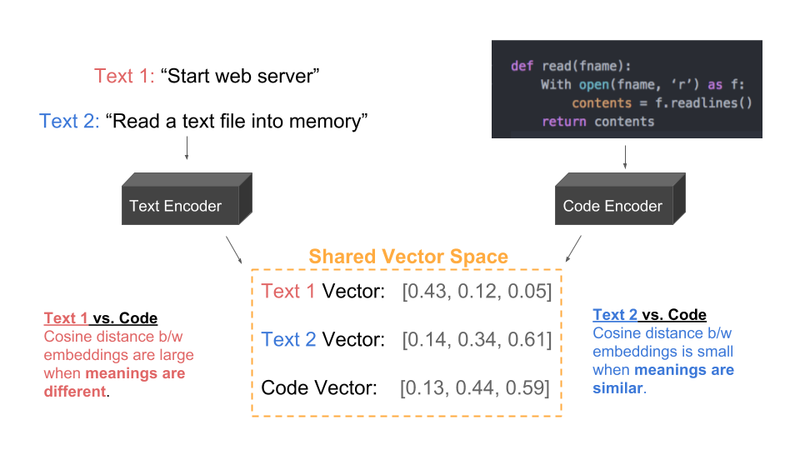 Initially, we experimented with the Universal Sentence Encoder, a pre-trained encoder for text that is available on TensorFlow Hub. While the embeddings from worked reasonably well, we found that it was advantageous to learn embeddings that were specific to the vocabulary and semantics of software development. One area of ongoing research involves evaluating different domain-specific corpuses for training our own model, ranging from GitHub issues to third party datasets. To learn this representation of phrases, we trained a neural language model by leveraging the fast.ai library. This library gave us easy access to state of the art architectures such as AWD LSTMs, and to techniques such as cyclical learning rates with random restarts. We extracted representations of phrases from this model by summarizing the hidden states using the concat pooling approach found in this paper. Next, we map the code representations we learned from the code summarization model (part 1) to the vector space of text. We accomplish this by fine-tuning the encoder of this model. The inputs to this model are still code blobs, however the target variable the model is now the vectorized version of docstrings. 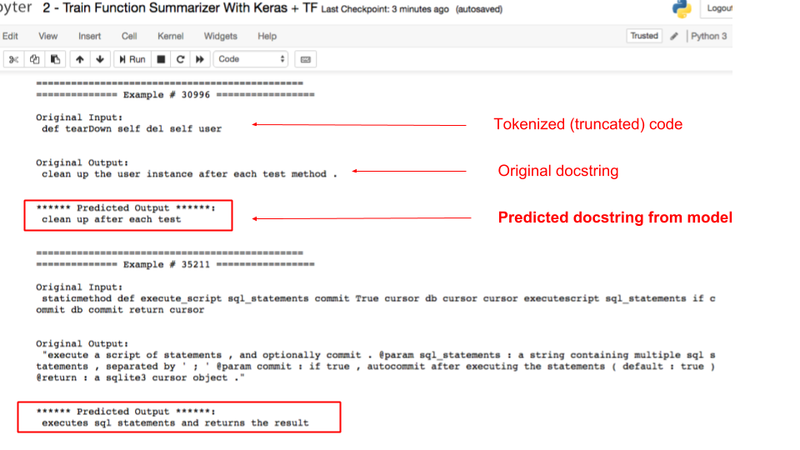 These docstrings are vectorized using the approach discussed in the previous section. Concretely, we perform multi-dimensional regression with cosine proximity loss to bring the hidden state of the encoder into the same vector-space as text. We are actively researching alternate approaches that directly learn a joint vector space of code and natural language, borrowing from some ideas outlined here. Finally, after successfully creating a model that can vectorize code into the same vector-space as text, we can create a semantic search mechanism. In its most simple form, we can store the vectorized version of all code in a database, and perform nearest neighbor lookups to a vectorized search query. Another active area of our research is determining the best way to augment existing keyword search with semantic results and how to incorporate additional information such as context and relevance. Furthermore, we are actively exploring ways to evaluate the quality of search results that will allow us to iterate quickly on this problem. We leave these topics for discussion in a future blog post. We are exploring ways to improve almost every component of this approach, including data preparation, model architecture, evaluation procedures, and overall system design. What is described in this blog post is only a minimal example that scratches the surface. Our open-source end-to-end tutorial contains a detailed walkthrough of the approach outlined in this blog, along with code and data you can use to reproduce the results. This open source example (with some modifications) is also used as a tutorial for the kubeflow project, which is implemented here. We believe that semantic code search will be most useful for targeted searches of code within specific entities such as repos, organizations or users as opposed to general purpose “how to” queries. The live demonstration of semantic code search hosted on our recently announced Experiments site does not allow users to perform targeted searches of repos. Instead, this demonstration is designed to share a taste of what might be possible and searches only a limited, static set of python code. Furthermore, like all machine learning techniques, the efficacy of this approach is limited by the training data used. For example, the data used to train these models are (code, docstring) pairs. Therefore, search queries that closely resemble a docstring have the greatest chance of success. On the other hand, queries that do not resemble a docstring or contain concepts for which there is little data may not yield sensible results. Therefore, it is not difficult to challenge our live demonstration and discover the limitations of this approach. Nevertheless, our initial results indicate that this is an extremely fruitful area of research that we are excited to share with you. There are many more use cases for semantic code search. For example, we could extend the ideas presented here to allow users to search for code using the language of their choice (French, Mandarin, Arabic, etc.) across many different programming languages simultaneously. This is an exciting time for the machine learning research team at GitHub and we are looking to expand. If our work interests you, please get in touch! 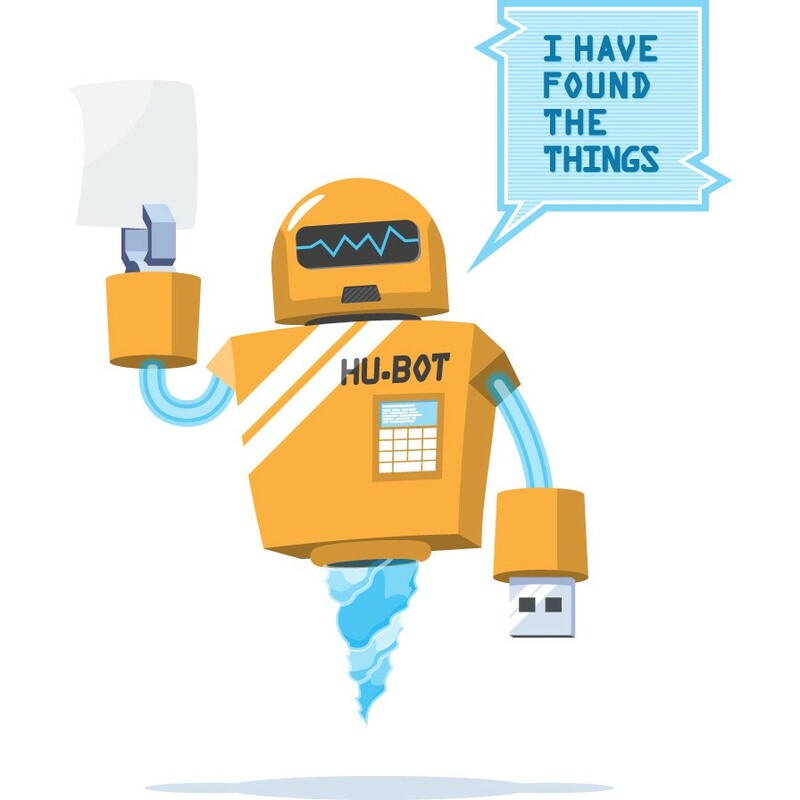 The post Towards Natural Language Semantic Code Search appeared first on The GitHub Blog. The Jenkins security team triages incoming reports both to Jira and our non-public mailing list. Once we’ve determined it is a plugin not maintained by any Jenkins security team members, we try to inform the plugin maintainer about the issue, offering our help in developing, reviewing, and publishing any fixes. Sometimes the affected plugin is unmaintained, or maintainers don’t respond to these notifications or the followup emails we send. The post Welcome to SaltConf18! appeared first on SaltStack. The post A NetApp IT Perspective: Data Science and the Data Lake appeared first on NetApp Blog. The Perl Toolchain Summit (PTS) is happening this week in Marlow, on the banks of the River Thames, in the UK. Most of the attendees will gather on Wednesday evening, with the real business kicking off at 9am on Thursday morning. For the next four days 32 Perl developers will be working intensively on the tools that all Perl developers rely on. Attendees log their activities on the wiki, and blog posts will appear during and after. You can see some of what goes on in semi real-time on twitter, via the #pts2019 hashtag. We're extremely grateful to MaxMind, who once again are a Gold Sponsor for the PTS. The attendees are brought together from around the world, and we're only able to do this with the support of companies from our community, like MaxMind. Founded in 2002, MaxMind is an industry-leading provider of IP intelligence and online fraud detection services. Thousands of companies of all sizes rely on MaxMind's GeoIP geolocation and end-user data for fraud prevention, ad targeting, content customization, digital rights management, and more. MaxMind's minFraud Network leverages this data along with IP, email, and device reputations, established from over 200 million transactions and events per month, to help online businesses prevent fraud with real-time risk scoring and data for modeling. A number of CPAN authors work at MaxMind, including Olaf Alders (OALDERS), Florian Ragwitz (FLORA), Mark Fowler (MARKF), TJ Mather (TJMATHER), Mateu Hunter (MATEU), Greg Oschwald (OSCHWALD), Andy Jack (ANDYJACK), Pat Cronin (PCRONIN), Ioan Rogers (IOANR), Ruben Navarro (RUBEN), William Stevenson (WDS), Ran Eilam (EILARA), and Kevin Phair (KLPTWO). Olaf Alders, founder of the MetaCPAN project, is a senior engineer at MaxMind, and will be attending the PTS. Our thanks again to MaxMind for supporting the Toolchain Summit.